Mike Leigh has been among my favorite film directors ever since I saw “NAKED” in 1993 – a disturbing, jarring and darkly comic film about a sociopath in London who wounds everyone he meets with words, not weapons. It was then that I decided to see as much of his oeuvre as I possibly could, and coincidentally, with “Naked”’s popularity a traveling Leigh film-fest came to San Francisco’s Roxie Theater soon afterward. I got to see some of this British chronicler of the human condition’s earlier work like “Nuts in May”, “Life is Sweet” and “High Hopes”. Everything after “Naked” and 1993 has been first rate as well, with the exception of the Gilbert & Sullivan-themed “Topsy-Turvy” which for some reason I still can’t bring myself to watch. Leigh does an amazing job portraying the British everyman and –woman going through life’s various personal crises, and the inability of most people to get at the heart of what’s keeping them from connecting effectively with other people. So now to “ANOTHER YEAR” , Leigh’s first film’s since 2008’s excellent and underrated “Happy-Go-Lucky”. That film was so stellar because it was such an inversion of Leigh’s usual method – a woman so obliviously happy and lost in herself that she clashes with the many unhappy people surrounding her. 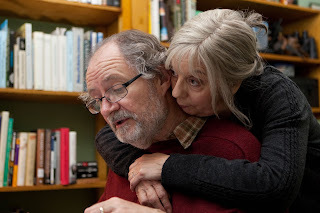 The long-married middle-aged couple, Tom and Gerri, at the center of “Another Year” are actually not all that far off from Sally Hawkins’ “Happy-Go-Lucky” character. They are the stable and happy pillars at the center of their circle of friends and relatives, though they’re all too aware of their friends’ and relations’ poor choices and social problems. The film follows them through the seasons, and is broken into four codas. Tom & Gerri’s happiness and stability is a locus point for all of those around them, and many of the scenes take place within their home, where their unhappy brethren often come to gather and seek some form of magic rub-off from these two. The film explores how some people can successfully navigate life’s ups & downs and come out solid and secure no matter what happens, whereas others are devastatingly unable to find even a small measure of happiness no matter how badly they want it. Gerri’s friend from work, Mary (played by Leigh favorite Lesley Manville), is the other centerpiece of the film. She’s the one for whom nothing works out in life, and whose grating, ultra-chatty, non-self-aware persona and inner sadness is extremely recognizable from other Leigh films. Unmarried and desperately lonely, she’s the counterpoint to everything that’s gone right in Tom & Gerri’s lives. She hits on their twentysomething son, ruins dinner parties, and longingly seeks approval from everyone she meets – except for the one man (Tom’s very sad, very overweight friend Ken) whom she rejects out of hand on superficial grounds alone. If you loved the incredibly annoying Brenda Blethyn in Leigh’s “Secrets & Lies” (“Sweeeet-hahhht! !”), you’ll love Mary just as much. Suffice to say I thought the film was another fantastic look at the unfantastic and everyday people who make up the large beating heart of humanity. Not many filmmakers have the insight that Leigh does nor the chops to display it, and “Another Year” is the latest in a long line of truly great films from him.